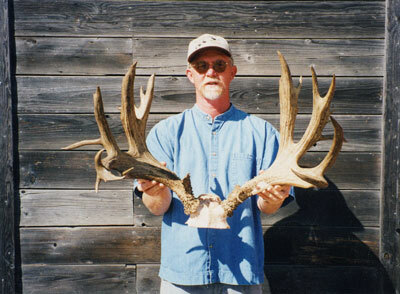 The mule deer rack shown above was taken during the 1999 season on Santa Rosa Island, just off the southern California coast. The rack is held by one of the guides working for Multiple Use Managers (MUM). MUM is the outfitter for Santa Rosa Island. The lucky hunter was Jeff Myerl from Pennsylvania. This is the largest ever recorded buck taken from the Island. The it measured 245 1/8 non-typical and 205 typical. Deer were brought to the Island in 1925 from the Kaibab region of Northern Arizona. MUM has a number of ranches for hunters interested in booking a high quality hunt. If you are interested in any of the hunting opportunities provided by Multiple Use Managers, contact Gordon Long at (800) 557-7087 or visit their web site at www.mumwildlife.com. Tell them you read about it at WesternHunter.com.